When Jean Gottmann popularized the term Megalopolis in the 1960's, he mostly had the Northeast Corridor in mind. By this time, so many interconnections had developed between the string of cities from Boston through Washington DC that it could be referred to as a single unit. Arthur Nelson and Robert Lang, two noted planning academics, continue this line of reasoning in their new book Megapolitan America, only now highlighting eleven Megapolitan Clusters around the United States. While this nation is a very large one spatially, a significant chunk of economic activity, real estate development, and innovation takes place on only 17% of the privately-held land area. The authors argue that this reality should effect how we conceive of ourselves as a nation. This is more than just a battle over geographic nomenclature. Once the boundaries of regions are widely accepted, they can define the scale of public and private activities and shape the impact of these activities. The cities of Dallas and Fort Worth formed with completely separate self-images, until a short while after the Census Bureau labeled them a single metropolitan area based on a quantitative definition. The change triggered an adjustment in the federal aid formula used by the FAA, and the two cities were compelled to cooperate on the construction of a single airport. This launched a string of practical joint actions, out of which the single identity of "Metroplex" emerged - the result of a convergence of both top-down and bottom up forces. So how do you find a Megapolitan Area? If urban systems are dynamic, the boundaries of Megapolitan Areas must be defined by movement. This is a fundamental insight Nelson and Lang adopt from Gottmann and decades of Census Bureau practice. 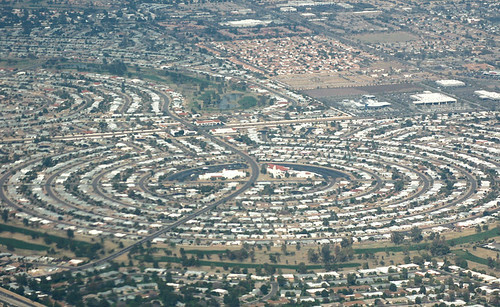 It may be tempting to define regions by drawing a circle around concentrations of stuff, whether population (where people sleep at night) or employment (where those who work in a fixed place spend a large portion of their week), but the movement of people, goods, water, animals, energy, and whatever you can think of through space is what connects places together. The authors use commuting data to define the shape of Megapolitan Areas, mostly because it's readily available. This works as a proxy but it also misses a majority of human movement, even most work-related travel, since our daily travel patterns are becoming more diffuse and harder to define on a two-point scale. What if you travel to the local office three days a week, work from home sporadically, and visit the regional headquarters a few times a month? Here's where Google or Apple could step in. They've both been amassing huge databases of personal locational information from smartphone users, at least those who have opted in. You can imagine meandering lines on a map, one for each individual path, crisscrossing into a jumbled mess. What most resembles a massive hairball? There's your Megapolitan Area. If Megapolitan Areas are defined as such by numbers, they remain that way with a story. Nelson and Lang use the apt word "organic" to describe a region that captures the public imagination by tapping into an already understood sense of place. Language is notoriously hard to dictate by fiat, which is why Americans still measure temperature in Fahrenheit. Even if the Census Bureau is convinced to create a new category for megapolitan areas - and the book makes a good case for it - the label will not have much currency until it is accepted by media outlets and the general public in each individual community. They also need a catchy name. Much of the book focuses on projecting population growth and development out to 2040, in order to predict the continued importance of Megapolitan Areas well into the 21st century. Suffice it to say that the authors are pretty bullish on American growth, expecting it to continue in roughly the same trajectory it has been on for the last several decades, not withstanding our major housing hiccup. Seeing that Las Vegas and the Sun Corridor (Phoenix to Tucson) are slated to be among the fastest growing regions brought to memory an image from a couple of weeks ago. James Howard Kunster was addressing the CityWorks (X)po in Roanoke, Virginia. He showed an aerial photo of houses stretching into the Arizona desert, then quickly remarked, "oh yeah, and Phoenix is toast. There will be no Phoenix" before moving on to the next slide. So what do you do when two people whom you respect differ in their forecast by ... oh, nine million or so? Well, you cut the difference. Kunstler is clearly being hyperbolic. There's too much vested capital in these Megapolitan Areas for even the worst-case scenario to simply erase them. On the other hand, Nelson and Lang could stand to internalize the possibility of resource scarcity into their projections. They've written a whole chapter on the pressure megapolitan growth will exert on farmland, water, and air quality, but they don't seem to accept that these pressures, in turn, will shape the built environment in a measurable way. For example, the authors point out that water use in the dry Sun Corridor, which is the highest per household in the nation, will have to be reduced somehow. But will those restrictions curtail business? Will future sunbirds be deterred if they can't have the lawn promised in the brochure? That's easy ... yes. Growth will slow down. But quibbling about the exact distribution of population would be missing the point of the book, and the authors are appropriately cautious in the epilogue with looking so far into the future. The question is whether the definition of Megapolitan Areas will continue to accurately reflect the American pattern of development into the future. Charles Darwin noticed two kinds of taxonomists, the "lumpers" who saw few species and the "splitters" who saw many species. Likewise, reasonable people could look at the same Megapolitan Areas and see many metropolitan areas connected to each other rather than a single whole. Or even a whole galaxy of neighborhoods and employment centers. This is not a problem. Really, we need as diverse a taxonomy as we have problems to apply it towards. The authors make a strong case for using the megapolitan scale for planning national rail infrastructure, which fits nicely because of the needed density and optimal range inherent to this technology. Some economic development efforts, at least for global markets, would work well at the megapolitan scale, but in other regional markets businesses and communities would be better served by competing with each other. However, there are points in the book where it feels like the Megapolitan scale is being championed as a superior way of dividing up the nation, rather than just another tool with some good applications. I'm personally very fond of the terms "urban" and "rural" and everything they connote, so it would be sad to see these traditional distinctions melted away into one big megapolitan stew. After all, it's just as legitimate to use labels on the basis of how we want the world to be than on how it currently is. Megapolitan Areas also have the liability of not being exhaustive, which makes the old-fashioned state boundaries more appropriate for applications where complete inclusiveness is necessary. I'm happy to think in terms of Megapolitan Areas and use the term in the way Nelson and Lang present it, along with several other geographical constructs that have their own appropriate uses.